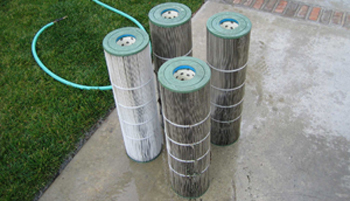 Keeping your pool’s filter clean is one of the most important aspects of a healthy pool and filtration system. San Diego Poolman can disassemble your filter system, remove the cartridges or grids, thoroughly clean all grids and cartridges, inspect filter system internals for damage, lube filter tank gasket, reassemble and recharge system with AquaPerl (Eco-Friendly D.E. alternative). *We recommend cleaning out your filtration system two times a year.